Congratulations to the BeagleBone Cape Design Contest Winners! 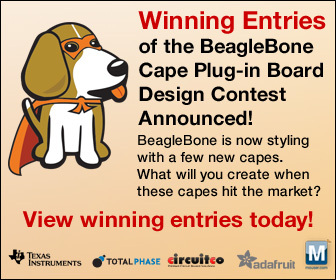 Total Phase is pleased to announce that the winners have been selected for the BeagleBone Cape Plug-In Board Design Contest! The three contest winners are Chris Clark, Elias Bakken, and Matt Ranostay. BeagleBoard.org launched the contest back on November 1, 2012 and gave hobbyists the opportunity to submit their schematics for their "capes", or new expansion boards for the BeagleBone. Total Phase co-sponsored the contest and rewarded each winner with their choice of a Total Phase development tool from our line of USB, I2C, SPI, and CAN tools. Additionally, Total Phase awarded 4 lucky winners with Total Phase tools in the weekly trivia contest. Congratulations again to the winners of the BeagleBone Cape Plug-In Board Design Contest! We look forward to seeing your cape designs implemented with the BeagleBone and hope that you enjoy your new Total Phase tools! To read more about the contest and the winners' designs, click here. Last month, the Total Phase team packed their bags and headed off to Europe to visit several of our international distributors before settling in Nuremberg, Germany for the Embedded World show! Embedded World is held annually and toted as the world's biggest exhibition and meeting place for the international embedded community. 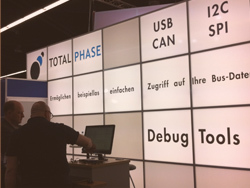 From February 26-28, Total Phase demonstrated our suite of USB, I2C, SPI, and CAN development tools to attendees from all over the world. Before and after Embedded World, we also had the exciting chance to touch base with many of our European distributors. Total Phase has a lot of exciting events coming up. Find out more about our upcoming tradeshow events on our website! Every day, the Total Phase Support Team receives many interesting questions from engineers about developing and debugging their devices and prototype boards with our tools and software. 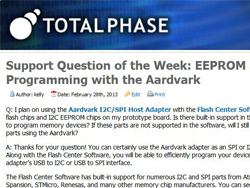 We've started a new series on our blog – the Support Question of the Week! Each week, we will post a new support question and answer to provide tips and tutorials for how our products and accessories can be used for fast debugging and quick development. Some sample topics featured in this series include EEPROM programming, using a level shifter board with the Aardvark adapter, and monitoring an SPI shared bus. You can read our latest addition to the series here. If you have any questions about Total Phase or any of our products, feel free to email us at sales@totalphase.com or support@totalphase.com. I got the Beagle I2C/SPI Protocol Analyzer up and running very quickly, and was able to debug my I2C code in a very short time. I wish now that I had gotten a Beagle I2C/SPI analyzer several years ago. It would have saved me a lot of time.